Source: Onslow County Confederate Soldiers Monument. Image courtesy of the North Carolina Department of Cultural Resources. Photograph by Tom Vincent. This monument commemorates the "Men Who Wore The Grey" from Onslow County. 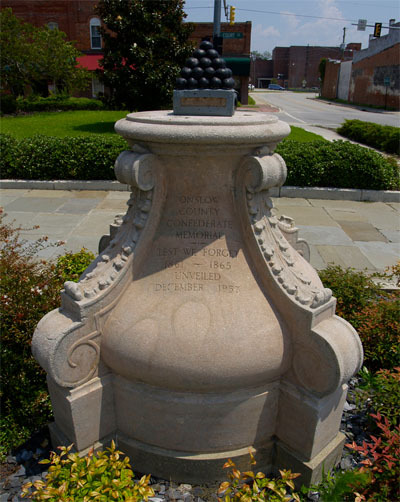 It is likely an unfinished monument as a small pyramid of miniature cannon balls sits atop a granite pedestal designed to display a more grand memorial such as a column or obelisk, or possibly a figure such as a Confederate common soldier. The base is a fairly ornate design, with volutes of acanthus leaves in bas-relief. 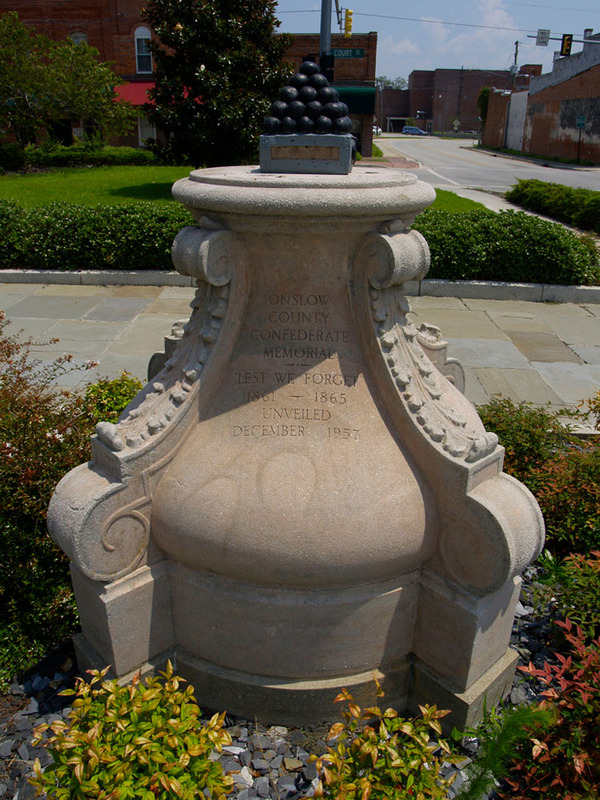 The monument sits at the entrance to the Onslow County Courthouse on Old Bridge Street. The front of the courthouse faces south. The monument sits in the center of a small rectangular garden bed, surrounded by evergreen and seasonal plantings. The bed sits in the center of a small plaza paved with slate stones. A flag pole flying the U.S. Flag sits in the bed behind the monument. The Onslow County World War I and World War II Memorial sits just a few feet away by the doors at the entrance to the courthouse.